Fig. 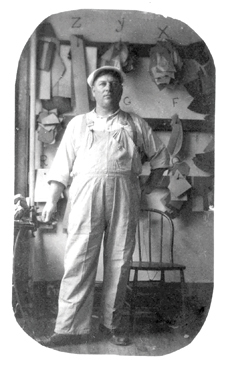 2: Fat's father, Rudolf Walter Wanderone Sr., first worked as a blacksmith's apprentice in the U.S. Fig. 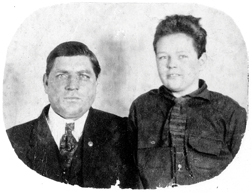 3: Fats at age 6 with his father in St. Louis. Fig. 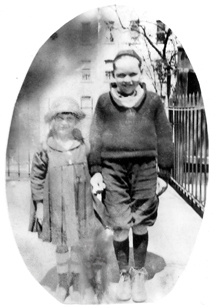 4: A young Fats and his little sister Bertha, probably by their home in New York City. Fig. 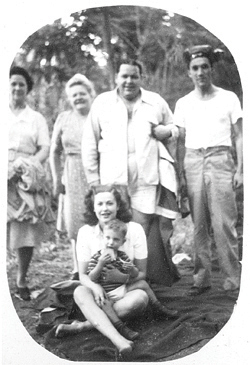 5: Fats and Evelyn (holding a young Doug Corwin) visit the family on a vacation trip to Bishop, Calif., in 1945. Fig. 6: Could this be Fats in a tuxedo (which he usually disdained) in 1941? Fig. 7: Fats' nephew, Doug Corwin, today lives in California. All this we know because these facts have been referenced in Fats' 1966 autobiography, in journalistic records, or in documents in possession of the U.S. Census Bureau, or at www.ellisisland.org. But not until Doug Corwin came along did we have any new information from an actual relative, from a person who had a real flesh-and-blood connection to the Wanderone family. Corwin, 64, would be Fats' nephew. The ad salesman lives in California's Napa Valley, about an hour north of San Francisco. He said he moved there with his family in the 1950s after having grown up in New York. Corwin said his mother - that is, Fats' sister - died when he was just 2 years old, and as a consequence he has lost a bit of the thread when it comes to the Wanderone side of his family. But even still, Corwin has been told a little and he's seen the old photos. Doug said his mother's actual name was Bertha Alice Wanderone, but that she often went by the nickname "Jerrie." I could never figure out why Fats identified his sister as "Jerry" (Fats spelled it with a "y") but that the U.S. Census Bureau listed instead a "Bertha." So this resolves that question. The U.S. Census Bureau also lists the approximate year of Jerrie-Bertha's birth at about 1918, which Corwin also confirms. Corwin says his mother (we'll call her "Bertha" from here on out) married his father, Bernie, on Aug. 2, 1942. At the time, Bertha's brother, Fats, would have been quite single and probably running around the East Coast making games. As you can see from his note to me, which I referenced earlier, Doug's mother died three years after she married Doug's dad. That means she would have been 27 years old. "Bertha died in childbirth with my brother Richard - she bled to death in an army hospital," Corwin explained. "They left her alone and they shouldn't have left her alone, and she was about 25 years old. So there were two of us, and my father remaining." Corwin said he was 2 years old at the time and has no recollection of his birth mother. But Corwin says his father, Bernie, kept in touch with Uncle Fats and the two would play pool on occasion. 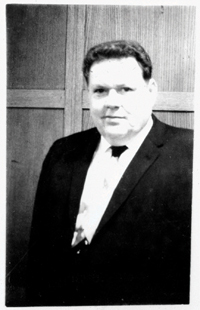 Corwin also said that his father and his stepmom went to visit Fats when he was doing an exhibition in Los Angeles during the 1960s, shortly after he became famous from "The Hustler." In his autobiography, Fats also mentions that another sister, Rosa, died tragically young. He wrote that her death came shortly before he and wife Evelyn were married, and that the date of that marriage was May 7, 1941. Separate records show Rosa was born in 1907, which means she would have been about 34 years old. Corwin had no details about the circumstances of Rosa's death, although he says a grave marker puts her final day as March 31, and that the grave marker is next to his own mother's, back in New York. Corwin did not have any information about Fats' third sister, Julie, who would have been another of his aunts. Data from the U.S. Census Bureau indicates she was born around 1909, which means she would be nearly 100 if she still lives. Census data also indicates she may have taken on the last name "Mills." I also reported in that earlier column that Fats lived at 403 W. 148th St., in Washington Heights, and that for some bizarre reason the U.S. Census Bureau listed a whole host of random other people at the address. Corwin explains that Fats' mother, Rosa, took on boarders. He also said that she would purposefully dress in rags when it was time to go pick up the rent check. "Her thing was that she acted like she was poor and acted like she needed the money. She didn't go around as the rich landlady with furs and diamonds; she went around in rags," said Corwin. I find this new detail about Fats' early home experiences somewhat fascinating. Corwin said that Fats' mother did not want to put on airs, did not want to appear to others as a woman of means, and so would actually dress in rags. Was this shameful behavior for Fats? Corwin himself notes the irony. "His mother went around all haggardly looking, looking like she didn't have any money but Fats was a big show-off, always driving around in Cadillacs," he said. Perhaps Fats saw his mother's dress-up-in-rags routine as a sort of con - that is, an effort by her to trick others into seeing her as something other than she actually was. Maybe that helps explain why Fats grew up to become the hustler that he was. OK, now on to the photos. Fig. 1 shows Fats' mom, Rosa (left), and Fats' wife, Evelyn (right), with the man himself in the middle. This photo was taken in 1944, when Fats was about 31. Fats always boasted of Evelyn's great beauty, and for once it appears he did not exaggerate. She was also known as quite a party girl. Evelyn herself told me not long before her death that she enjoyed Fats' company, because he knew how to show a girl a good time. Fig. 2 shows a picture of Rudolf Wanderone, Sr., Fats' dad. I love this picture. It shows the Swiss immigrant in his workman's clothes. His first job in the United States was as a blacksmith's apprentice, a job that Fats claimed paid him only $1.50 per week. It looks from this photo that Rudolf Sr. may actually be engaged in the practice. Fig. 3 featuring Fats at age 6 and on vacation with his father in St. Louis, appeared in Fats' autobiography, "The Bank Shot and Other Great Robberies," which was written with Tom Fox of Sports Illustrated. Fig. 4 is a bit tough to see, as the print has been damaged. But on the left is little Bertha, and on the right there's young Fats. Fats insisted that he was already hustling at pool and marbles at this age, when he was just wearing knee-pants. From the looks of it, this picture could have been taken in front of their house at W. 148th Street, in upper Manhattan. Fig. 5 shows Fats and Evelyn during a family vacation. Doug Corwin says this photo was taken in Bishop, Calif., in 1945. Here's the caption information he provided: "Rudy and Evelyn (holding Doug) took Grandma Wanderone and Evelyn's mother to visit Bernie and Jerry in Bishop, California. They were surprised to find Jerrie pregnant. Jerrie and Bernie moved to Soap Lake, Washington, shortly before her death. Jerrie took this picture in 1945." Fig. 6 is a cool picture of Fats in 1941, shortly after his marriage with Evelyn. It looks like Fats is wearing a tuxedo here, a piece of apparel for which he always expressed disdain - especially when mixed with pocket billiards. 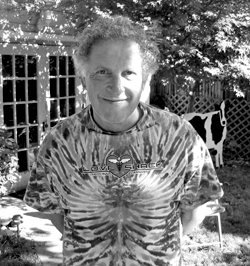 Doug Corwin, who appears in Fig. 7, is still going through his old files and believes he has an old tape-recorded interview with Evelyn Wanderone, Fats' first wife, lying around somewhere. Hopefully we'll have an update later with more details. Doug's stepmom further remembers that Fats' third sister, Julie, also had children. So maybe through the magic of the Internet, they'll see this column and make contact. Are you a long-lost family relation of a famous pool player? Have a story to tell or old photos? Write me at hustlerdays@yahoo.com and I'll post it up at www.poolhistory.com. You can check out the blog section there for documents, photos and expanded versions of earlier editions of Untold Stories. I've also recently posted a new interview with Allison Fisher from the Derby City Classic. R.A. Dyer is the author of "The Hustler & The Champ," a biography of Minnesota Fats and Willie Mosconi, new out from The Lyons Press. He is also the author of "Hustler Days: Minnesota Fats, Wimpy Lassiter, Jersey Red, and America's Great Age of Pool," now available in paperback.